The Everest Base Camp Trek via Gokyo is a journey that, in addition to the already existing aspects of the regular base camp journey, also adds in the visit to the holy Gokyo lakes of the Khumbu. From sapphire blue Himalayan lakes embedded in the very heart of the river valleys shadowed by the peaks to arid landscapes with corroded hill caves, the EBC Trek via Gokyo enchants every trekker and guarantees glorious memories. Starting the trekking journey from the famous mountain village of Lukla, the trail beautifully winds through the verdant trans-Himalayan landscape of the Everest region to go through popular Sherpa villages and towns like Namche Bazaar and Lobuche. 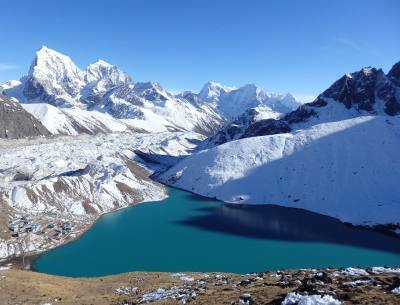 With off-beaten paths added to the journey, like visiting Machhermo and Thangna, the trail then reaches the beautiful turquoise lakes of Gokyo- holy lakes believed to be the abode of the snake gods- the Nagas, by the Hindu people. The serenity of the journey is truly unmatched as the sapphire lakes set against the gorgeous ivory mountain peaks present a sight close to the heavens itself. Moreover, the journey also lets trekkers cross the Cho La Mountain Pass and has highlights like visiting the vantage points of the Gokyo Ri (5360m) and Kalapatthar (5550m). It is a beautiful journey suited for trekkers who want to take a diversion from the regular base camp trek journey to experience the isolated settlements of the Khumbu. The Everest Base Camp Trek via Gokyo is best suited to do during the months of March to May when the spring season sets amazing blossoms of rhododendrons across the terrain and during the months of September to November when the autumn season presents clear and crisp weather conditions for the best views of the peaks. Let Destination Unlimited be your travel companion in this adventure. Our well-versed and highly professional guides and team members will make sure that you get the best trekking experience of your life! With excellent services and many such provisions, we, at Destination Unlimited, assure you that your travel experience will be every bit the same as the one in your imagination. Day 01: Arrive in Kathmandu (1,300 m). Arrive at the Tribhuvan International Airport at any time. When you arrive, you will be welcomed by one of our team members. He will help you transfer to your Hotel. Overnight at a Hotel. On this day, you will have a guided sightseeing tour of the Kathmandu valley. The tour consists of visiting the UNESCO World Heritage Sites of the city; they are the Swayambhunath Temple and the Kathmandu Durbar Square. These sites are the pillars of faith and culture in the city. After the tour, you will be transferred back to the Hotel. Overnight at a Hotel. Day 03: Fly to Lukla (2,840 m) and Trek to Phakding (2,610 m) – 3 hours. In the early morning, you will have a short flight to Lukla. The flight is quite beautiful and takes about 40 minutes. Lukla is often the main points from where most of the Everest Trekking journeys start. From Lukla, you will make your way through amazing lush woodlands towards Phakding from where the view of the Kusum Khangkaru peak () is quite amazing. Overnight at a Guesthouse. Day 04: Trek to Namche Bazaar (3,440 m) – 5.5 hours. From Phakding, you will trek along the amazing trail into the Dudh Koshi River valley, making your way towards Monjo from where you will enter the Sagarmatha National Park. Trekking through the park's acreages, you will reach Namche Bazaar- the bustling Himalayan Sherpa town and the commercial hub of the Khumbu region. Overnight at Guesthouse. This day is set aside for acclimatization. From Namche, you can visit the famous Everest View Hotel that presents wonderful views of the Everest peaks like Taboche (6367m), the Kongde Ri (6187m), Mount Lhotse (7861m), the Lobuche peak (6119m) and the Ama Dablam (6856m) among many others from its windows. You can also pay a visit to the Syangboche airstrip that presents amazing views of the gaping Dudh Koshi River valley and of the town as well. Back at Namche, you can visit the Sherpa Culture Museum and the Everest Photo gallery. Overnight at a Guesthouse. Day 06: Trek to Phortse Thanga (3,810 m) – 5 hours. From Namche, you will steadily gain altitude, slowly trekking towards Phortse, passing by small stupas and Chortens and the long Mani stone wall that is carved with prayers. In the trail further on out, you will also pass by the Khumjung village and the settlement of Mong from where you will descend almost 200 meters on a clearly marked trail to Phortse. Thanga. Overnight at a Guesthouse. Day 07: Trek to Machhermo (4,470 m) – 5 hours. Passing by many Dzong (the hybrid of a cow and a yak) and Himalayan goats along open pastures, you will make your way towards Machhermo. You will likely come across many Kharka- small huts used by herders for their cattle throughout the journey. On your trek today, you will reach Dole from where you will hike back up on to the rather windy ridge towards Lhabarma and Luza and eventually to Machhermo. Overnight at a Guesthouse. Day 08: Trek to Gokyo (4,790 m) – 5.5 hours. From Machhermo, you will start the trekking journey with a steep climb up to the ridge above the village from where you can get majestic views of the Kangtega Himal (6782m) and the Cho Oyu Peak (8188m). The trail then levels out and is plain as far as Pangka. From here, it further continues to first of the Gokyo lakes. The trail becomes flat and you will eventually pass the second lake and reach the main Gokyo Lake. Overnight at a Guesthouse. Day 09: Trek to Gokyo RI (5,483 m) and Back to Gokyo – 5 hours. From Gokyo, you can enjoy mesmerizing views of the mountain peaks as they make a wonderful towering backdrop contrasting against the deep blue of the water. Early in the morning, you will make your way to Gokyo Ri. The climb takes about 2 hours and is rather strenuous, but well worth the effort. From Gokyo Ri, you can get absolutely astounding views of Cho Oyu (8188m), Everest (8848m), Lhotse (8414m), Makalu (8463m) and Cholatse (6440m). After spending time at Gokyo Ri, you will return back to Gokyo. Overnight at a Guesthouse. Day 10: Trek to Thangna (4,500 m) – 4 hours. From Gokyo, you will then steadily descent down the ridges and trek on greener trails again to reach Thangna. The distant looming views of the peaks add to the outer-worldly atmosphere of the trek. Your entire trek today involves mostly descents and gorgeous landscapes and bio-diversity will keep you company. Overnight at a Guesthouse. Day 11: Cross Cho La pass (5,420 m) and Trek to Dzongla (4,830 m) – 7 hours. Today is a long trek where you will be crossing the High Mountain Pass of Cho La. Starting before sunrise in order to reach the pass by avoiding the bad weather conditions later in the day, you will start to climb steeply up towards the crossing. As you reach the top, you will be rewarded by the magnificent views of the cerulean mountain peaks that rise from the ground like silver entities of colossal height. Then you descend to the Dzongla. Overnight at a Guesthouse. Day 12: Trek to Lobuche (4,910 m) – 4 hours. The trail continues along the moraine from Dzongla towards Lobuche. Along the way, you will get splendid views of Kalapatthar (5550m) and Mount Pumori (7165m). The trail is jaded by the alpine woods and rhododendron trees covered in occasional snow, giving the trail a whimsical atmosphere. You can reach Lobuche maintaining a steady pace. Overnight at a Guesthouse at Lobuche. Day 13: Trek to Everest Base Camp (5,365 m) and then Back to Gorakshep (5,180 m) – 8 hours. From Lobuche, you will make your way today towards Gorakshep. It is the last overnight stop before the Everest Base Camp. It is dotted with few lodes and is quite sparse in population. From Gorakshep, you will then make your way towards the base camp of the world's tallest mountain peak. 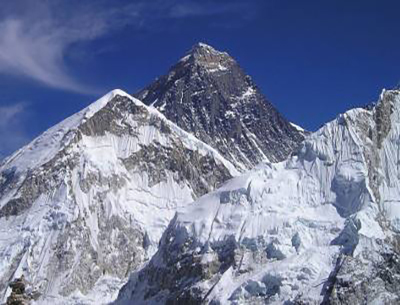 From here, you can get views of the Khumbu Glacier and the Khumbu Icefall, as well as dramatic views of the Khumbutse (6608m) and Lingtren Himalayas. After spending time at the base camp, we will return back to Gorakshep. Overnight at a Guesthouse. From Gorakshep, you will make your way towards the vantage point of Kalapatthar. The trek to the famous vantage point is done early in the morning before sunrise so that you can witness the dream-like moment of the sun rising from amidst the Everest Himalayas. Kalapatthar is famous for its panoramic views of the entire Mount Everest massif and many neighboring peaks. After taking in the grand beauty of the panorama, you will then trek back down towards Pheriche, making your way once again into the Dudh Koshi River Valley. Overnight at a Guesthouse. From Pheriche, you will wind across terrace farms and open pastures of the mountains dotted with cattle and yaks back towards Namche Bazaar, accompanied by the beautiful silver mountains. At Namche, you can spend the rest of the time observing the lifestyle of the local Sherpas. You can also shop for souvenirs in this Himalayan region. Overnight at a Guesthouse. Day 16: Trek to Lukla (2,840 m) – 6-7 hours. From Namche, you will trace your way back once again on the well-beaten path, passing through the villages of Phakding and Monjo to have an overnight stay at Lukla. The Sherpa culture is quite prominently felt as you will pass by Mani stone walls carved with prayers, spires decorated with colorful flags inscribed with Buddhist chants and Gompa with embedded prayer wheels. Overnight at a Guesthouse. Day 17: Morning Flight from Lukla to Kathmandu. 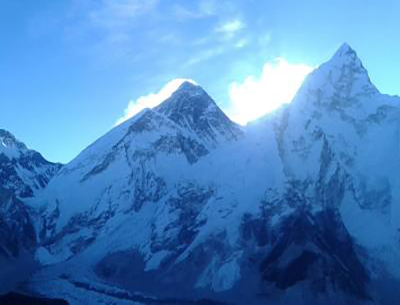 Today, you will bid your goodbyes to Khumbu's mountains one last time as you take the morning flight back to Kathmandu. Upon landing once again at the city, you can spend the rest of your time as per your preference, doing shopping or relaxing at the Hotel. Overnight at a Hotel. Day 18: Leisure Day and Farewell Dinner in Kathmandu. This day is set aside for your rest and relaxation and also acts as a contingency day in case there are any Lukla flight delays. You can also choose to visit some of the world heritage sites in the valley like durbar squares in Patan and Bhaktapur. In the evening, you will have a celebratory dinner to celebrate the successful completion of the trekking journey. Overnight at a Hotel. Day 19: Transfer to the International Airport for Your Final Flight Departure. Approximately three hours before your flight, you will be transferred to the airport for your final flight out of Nepal. 3 Meals a Day (breakfast, lunch and dinner) during the trekking.